A few years ago I had just started a new job working as a G.M. for regional rental company. Having passed all the required background checks, drug screens, etc. I had been at the new job for approximately two weeks. I arrived at work one Thursday morning, after having the previous day off, to the frantic calls of my District Manager. It seemed that on my day off someone claiming to be a federal marshal had called also claiming to have a federal warrant for my arrest. It seemed that I had obtained an online loan which I had never repaid. And this, it seemed, constituted a manhunt by the U.S. Marshalls service. Knowing this is the last call a D.M. wanted to receive about his newest manager, I insisted he drive to my store immediately. Once my boss arrived I gathered him and several other coworkers in the back office, and called the number left by the ” marshal”. The phone was picked up on the third ring and answered by a man with a very thick Middle Eastern accent. I identified myself and said I was returning the call from the previous day. The man on the phone, who would only identify himself as Mr. Smith, said he had been looking for me. Luckily for me I had several years in the financial services industry and that had made me an expert on F.D.C.P.A (Fair Debt Collection Practices Act) guidelines. So I began to press for information. When I asked for the name of the company which I borrowed the money from, I was told that I knew what it was regarding. Anyone who is familiar with collection laws, know there are several guidelines companies would never dare break. You can only call between the hours of 8:00 a.m. and 9:00 p.m.
Nonpayment of a loan is generally a civil matter, not a criminal one, and you never disclose information to a third party. Mr. Smith had already broken two of these cardinal rules, by saying I had obtained a loan that had never been repaid and that he had a criminal federal warrant. So I went on the offensive. Pressing for more and more information. I asked for Mr. Smith’s full name, and was told it was irrelevant. A contact number for the alleged debtor so I could contact them directly, denied. I asked for a number for the field office which Mr. Smith worked out of, also denied. Getting somewhat frustrated, I decided to try another tactic. I advised Mr. Smith that it was not worth the hassle, so I would just pay the account and be done with it. Mr. Smith (obviously excited) said that would clear up the matter completely. I asked for an address, and said I would mail out a money order that day. Unacceptable, Mr. Smith advised, the account had to be paid right then over the phone. I said I did not have a means of paying over the phone and pressed for an address again. Mr. Smith said that would not do and he would just have to come and arrest me. Up until this time I had managed to keep my cool. I decided to let Mr. Smith have it. I advised him of my financial services background, my knowledge of F.D.C.P.A guidelines, and the fact that I knew he was a scammer. When that did not get a reaction, I began with a personal attack that would make the most hardened criminal blush. In the middle of my tirade Mr. Smith began to laugh. He advised me that he was a scammer that he had been doing it for years, and he would never be caught. He said that he was in India, and that he liked me, he said if I ever desired a career change come find him and he would make me rich scamming people. Then Mr. Smith hung up the phone. I immediately called back, but my number had been blocked. I hung up and called back from my cell phone, Mr. Smith answered, I identified myself, click. Over the next week I continued to call back with different numbers, always with the same result. Mr. Smith answered, I identified myself, he hung up and blocked me. I typed the number into Google and was bombarded by post of people who had similar experiences. Some who had paid, some like me, who had not. I never did find out for sure how the scammers had gotten my information. Probably from a social media site, or something I had purchased online from an un-secure site. Ralf Skirr’s comment: When I got the offer for this guest post, I asked myself: How does it fit to Internet Business Mastermind.com? It’s a report about a truly bold telephone scam. So, an offline thing – not what this blog usually is about. 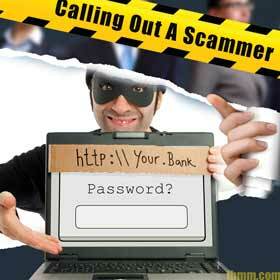 The increasing distrust and fear of being scammed. I’ve been sent invoices for things I never ordered, online and offline, many times. People are sent to payment pages, and, in the end, get nothing for their money. We are being lied to on sales pages with fabricated income claims, and fictional testimonials. We buy software that doesn’t work as advertised. Lawyers are sending us intimidating emails. We’re emailed JV offers that require us to wire large amounts of money to obscure locations. Huge discounts often turn out to be blatant lies. What does it mean for us as freelancers or business owners? We need to purposefully work on building trust! I have written about creating trust within affiliate offers before. Now it might be time to look at the bigger picture. What are the steps we can take to make our branding, our web site, our sales process more trustworthy? Previous article: Should You Put Prices On Your Web Site?